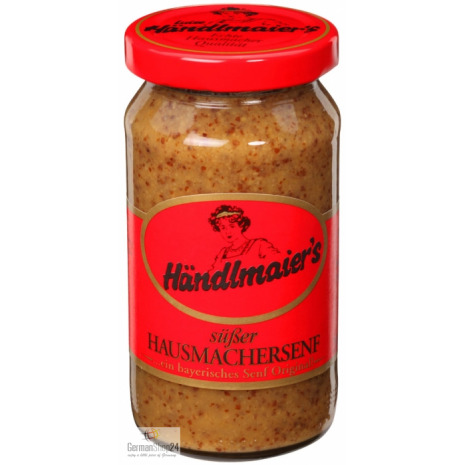 A genuine classic and Bavaria's most popular mustard at the same time - the sweet homemade mustard made by Haendlmaier. The sweet homemade mustard is the classic made by Haendlmaier – and Bavaria's most popular mustard! The traditional product is being prepared according to the proven original recipe since 1914 and not only to Weißwurst a must. The sweet homemade mustard tastes excellent with Bavarian meatloaf (Leberkäse), refines dressings for an incomparable taste and is famous across national borders for the past 100 years. Ready to eat! Please store in a cool and dry place! 200ml / 6.76 fl. oz NET. WT. Water, brown sugar, mustard seeds, vinegar, spices.